An often overlooked aspect of routine hydro turbine and bearing maintenance is inspection of the grout and sole plates that support umbrella-type vertical hydro-generator bearings. These areas are subject to static and dynamic forces due to rotor weight, vibration, and hydraulic loading, causing deterioration of the grout and deflection of the support structure. Over long periods of time, this can lead to bearing load and alignment issues. This presentation discusses diagnostics and recommended corrective action. Sole Plate/Grouting arrangements are prevalent in umbrella-type vertical hydro-generator units where the bearing bracket is mounted directly to the foundation. Cement-type grout material was used in most of the original installations to install the sole plates in the foundation pockets. Frequently these areas are not inspected or included in routine maintenance procedures. Sole plates and the surrounding grout are subject to multi-directional forces, putting them at risk of deterioration, misalignment, or softened support. Variation of shaft alignment and plumb conditions. 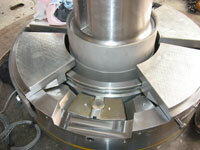 Increase in guide bearing loading. Accelerated deterioration of grouting, vibration. Visual inspection of sole plates and grout. “Sound” sole plates with hammer. Measure movement between sole plates and foundation with dial indicator. Check for loose sole plate hold down bolts. Tighten sole plate hold down bolts. Engineered solution including study to ensure adequate sole plate area and grout strength (in shear) for application. Investigate the possibility of a retrofit to mechanical- or hydraulic-equalizing thrust bearing design. To request a Kingsbury Field Service engineer to inspect your vertical hydro turbine bearings, call us at 215-956-0565 or email Expert@kingsbury.com.